We can ship to virtually any address in the world. Note that there are restrictions on some products, and some products may not be shipped to all international destinations. 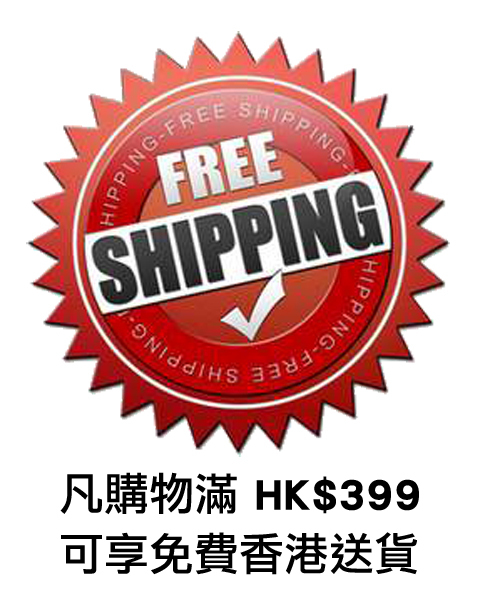 Free Shipping is available within Hong Kong SAR on orders over HK$399. We ship local Hong Kong orders through Ta-Q-Bin, SF Express or Hong Kong Post (Sm@rtPost). Your package will be delivered via the most suitable and appropriate carrier and directly to residential/commercial addresses (and we do NOT deliver to P.O. box nor Hotel). We will notify you via email about the estimated delivery dates. All packages will be delivered ONE time only. Please make sure that someone is available at the shipping address, and make sure that you enter the correct contact number during checkout. For residential addresses, the courier may call you before shipping. Should a second delivery attempt is required, a surcharge of HK$39 (plus any remote area charge if applicable) will be charged. In addition, if you have a request for a specific delivery arrangement (e.g., time etc. ), you may contact the courier company for such arrangement. Please also understand that we may be able to pass your special request to the courier, but we may not be able to control how they fulfill such requests. For International, we ship all international packages through DHL Express. The estimated delivery days for all our supported destinations, are shown in the below table. For destinations not shown below, please e-mail us at cs@lotusmart.com for a quote. Please also note that the shipping rates for many items we sell are weight-based. The estimated packed weight of any such item can be found on its product detail page. If you need to return an item, simply login to your account, identify the order using the "Complete Orders" link under the My Account menu and click the Return Item(s) button. Or you can simply email us at cs@lotusmart.com and we will guide you through the process of returning the package. We'll notify you via e-mail of your refund once we've received and processed the returned item. When ordering from LOTUSmart.com, buyers are responsible for assuring the product can be lawfully imported to the destination country. The recipient is the importer of record and must comply with all laws and regulations of the destination country. Orders shipped outside of Hong Kong may be subject to import taxes, customs duties and fees levied by the destination country. The recipient of an international shipment may be subject to such import taxes, customs duties and fees, which are levied once a shipment reaches the recipient's country. Additional charges for customs clearance must be fulfilled by the recipient; LOTUSmart has no control over these charges, nor can LOTUSmart predict what they may be.